Hi! This is Verena filling in for my mother. With the upcoming holidays Mom needed a few extra columns written so I offered to write one. In this column I will write about my recent birthday party. My birthday was December 10 and I turned 20 years old. These years sure don’t slow down! I’m officially no longer a teenager. I can’t believe it’s this time of year again. Snow flying and icy roads. Safe travels for those of you that need to drive in bad weather. My favorite thing I like about winter is when Mom and my sisters and I all relax around the table with hot chocolate on those cold winter mornings. Oh, and of course we love to chatter and tell stories of days when we were children. I remember the many fun times of winter sledding. I still enjoy it very much. Of course, I’m now the one driving our pony Stormy with a metal sled tied to the back of the pony cart. I drive fast trying to throw someone off into the snow—especially my ornery brothers. We have a nice open hayfield where we go sledding. On Sunday, December 10, I had my friends and family over for a birthday supper. I wanted to do a little something different, so we had a mystery supper. It was quite interesting such as “Idaho’s pride and joy” was mashed potatoes, “gold digger” was a fork, “silvery moon” was a spoon and “happy harvest” was corn. I had no idea what anything was but knowing my mom very well (she made the menu) I figured out a lot. I ended up with a salad but no ranch dressing and no fork. I ate my salad with a spoon which was a little complicated. Also a few people ended up with no fork or spoon. I ended up with mashed potatoes and no gravy. Some got ranch dressing but no salad. One of them had to eat corn without any silverware. We had a good laugh at some of them trying to eat. I appreciated all the gifts I received. The menu was hot wings, mashed potatoes, gravy, pork chops, corn, salad, veggies and cheese. For dessert we had dirt pudding and birthday bars. Later ice cream and cake was served. After everyone had their plate and we tried to eat what we had with what we ordered, we could go get whatever food (and silverware) we wanted. I had 20 friends here and then Dad and Mom, Timothy and Elizabeth, and Mose and Susan served our food to us. We had to mark six items from the menu. While the servers filled our orders we sang Christmas carols. Mose and Susan are now happily enjoying their new home. They are loving every bit of it. We really miss not seeing them every day. They still have a lot to unpack so we assisted Susan one day. Sister Elizabeth, Nikiah (who Elizabeth babysits) and my sweet little niece Abigail were also there. We sure enjoy little Abby. She loves taking my covering off my head and taking out my hair clips. She will then put them all back in my hair. Shoes are another thing she’s discovered. She’ll take my shoes off and try putting them on her little feet. She likes to walk around with “big girl” shoes. She’s been getting all her teeth so that makes her unhappy once in a while. Merry Christmas and may God be with each and every one of you as you travel into the New Year of 2018. God bless you! I will share a recipe for white Christmas cookies but they are good any time of the year. Cream Crisco and sugar. Add eggs and beat well. Add flour, soda, salt and extracts. Add cream; mix well. Roll out very thin and cut into various shapes. Decorate with colored sugar sprinkles or whatever you like. Bake at 350 degrees for 5–8 minutes. Store in tightly-covered container. Love this column. So refreshing. The column has not come to my email for several weeks. Is their a problem. Bmschiffli@gmail.com. Yes there is a problem — and it is not at your end! We are trying to get to the bottom of this after an office move including our electronics. So sorry. Sounds like you had a wonderful birthday indeed! So very blessed to have wonderful friends and family to help you celebrate. May God Bless you and you entire Family in the new Year. 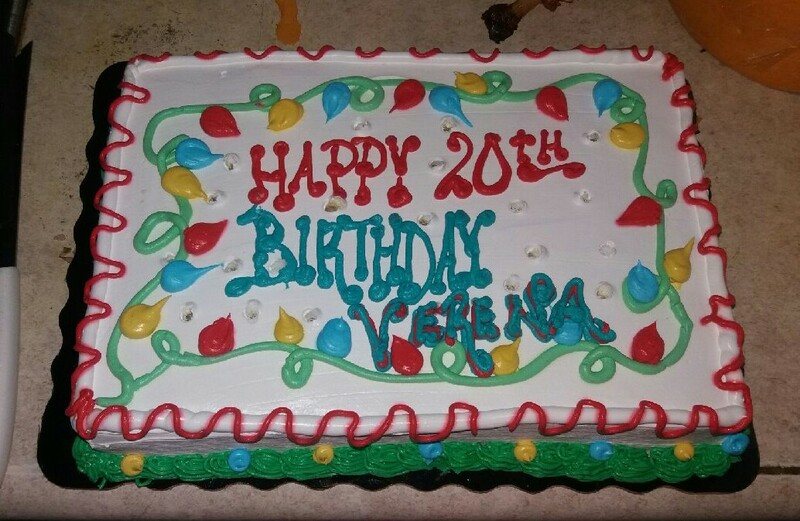 Happy belated birthday, Verena! It sounds like you had a lovely party. I enjoyed reading your article very much, especially the part about sitting around the kitchen table having talks and hot chocolate with mom and sisters. Such times make for precious memories! Blessings on your new year! 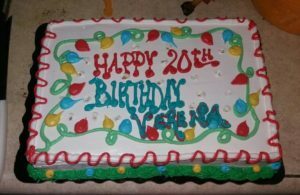 Happy birthday Verena! and that supper sounds like a lot of fun. Happy Birthday, Verena, and all the best for the new year. You wrote a great column! Happy Birthday, Verena. Thank you for such an enjoyable column. How exactly does one pull sleds with a pony? Are you driving a cart with sleds behind?